Calvin L. Smith: "God is no longer a racist"
Actually, according to this flawed logic that last phrase should read, “God is no longer a racist” because, as we all know (and supercessionists freely concede) in Old Testament times biblical Israel was indeed God’s chosen people. God did choose for Himself a people - the Jews - who were special in God's sight. So upon reflection, when someone accuses a theology of the Jews as God's continued people of being inherently racist we are left with two logical choices. Either a) God is no longer a racist, or b) God’s choosing of a peculiar people, as He did in Old Testament times, was done in such a way which was never racist to begin with. If the latter, how then can the view today that God has not finished with His people Israel also be considered racist? It can't. And of course we also know biblical Israel was far from racist. She practised an integrationist approach which welcomed all manner of ethnic non-Jews within the congregation of Israel. (More on this in a future post.) To be sure, a minority on the fringes of Christian Zionism may well be racist, but it simply won't do to implicate everyone who holds to the view God has not finished with the Jewish people as somehow crossing the line into racism. Unnecessarily inflammatory language and straw man building such as this merely turns the theological debate into a political football. So next time someone pompously asserts that a theology affirming God’s favouritism towards the Jews is somehow racist, I suggest a response (in a suitably humble manner, of course) to the effect that, “Oh, I’m glad to hear God is no longer a racist”. Then explain how, according to their logic, He used to be in Old Testament times. I’d be interested to hear their responses. Adapted from a post originally published on the Midlands Bible College blog. I have often thought that the language of 'racism' and 'apartheid' are unhelpful to the dialogue, so I agree with you in part here Calvin. But on the other side there is a tendency by some to identify supercessionists as being anti-semitic. This is why those who hold to a Covenantal theology seek to highlight unity and continuity with biblical Israel where God's single plan is now through the church that includes Israelites, Jews and Gentiles. As for favouritism - was the Old Covenant ever about favouritism? God set before the Israelites a blessing and a curse through obedience (or not) to the law - those who seek to live by the law without faith are therefore under a curse because the flesh is weak. God chose Abraham to be a blessing to all nations by faith, and Israel was called to be part of that blessing by faith not by works. Rather, it challenges the accusation levelled by several well-known anti-Israel Christians that anyone beliving God has not finished with the Jewish peple, or is a Christian Zionist, is promoting a racist theology. 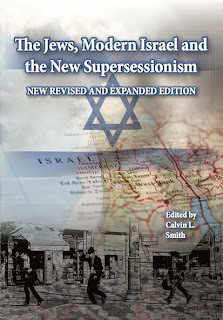 No, I don't think supercessionism automatically makes one an anti-Semite, just as being a Christian Zionist does not make one a racist. Calvin - I don't get paid to express opinions about global warming ;o) Seriously, I have to be careful what I say on this issue as I am media trained to express the view of my employer. So I just sit back and see how the cookie crumbles. Calvin, that's a fantastic post, thanks.